We went to Germany a couple of weeks ago to visit my in-laws and, while we were there, we spent a morning shopping in the lovely city of Cologne. As usual, we took Molly (our Labrador) along, and I reconciled myself to our usual routine of Natalie going into the shops and Molly and I waiting outside. (An arrangement that works well for all of us, to be fair.) But to my surprise, practically every time we hung around outside a shop that Natalie had disappeared into, a member of staff came out and invited Molly and I to come in, too. The sports shop. The book shop. Even Starbucks! As anyone with a dog and any form of a social life will know, finding places that are dog-friendly can be a bit frustrating. Whether it’s beaches, pubs, shops or hotels, each place has its own attitude to our canine friends. In thinking back over our experiences with Molly, I’ve come to the conclusion that there are four distinct categories of ‘dog-friendly’ establishment. 1. No dogs. Some places are very clear from the start that no dogs are allowed. They put it on their adverts. They have signs at the entrance. They make no provision whatsoever for anything with fur. While it’s tempting to try to smuggle the dog in (just for fun) or to try to convince them of the error of their ways, the only real solution is to move on and find somewhere more enlightened. I stopped at a pub in Wales a year or so ago and popped in to ask if it would be OK to bring Molly in while I grabbed some lunch. The lady behind the bar stared at me as if I had asked if I could drop my pants and smear myself with peanut butter. Mess? Would this dog make a mess? “Yes.” Clearly, this was not a common request. “A dog in the pub?”. “Yes.” I hadn’t appreciated that the situation was so complex. “Oh, no. Definitely not. No dogs in the pub. We can’t have dogs in here.” Clearly a cat person. 2. Small dogs only. This is my real bugbear. Places that claim to allow dogs but then do everything to stop you actually bringing a dog with you. Self-catering cottages are the main culprit, but some pubs and restaurants are equally guilty. “Do you allow dogs,” I asked one agent when trying to rent a cottage in St. Ives for a week. The advert had stated quite clearly that, yes, dogs were welcome. “A labrador.” And she’s a ‘she’, not an ‘it’. “So you don’t really welcome dogs, then.” Labradors aren’t large. Great Danes are large. Labradors are medium, at most. “Yes, we do – but only small ones.” Muppet. There was also the place that “usually accepts dogs” but couldn’t at the moment as they’d only just refurbished the house and wanted to keep it tidy for a little while. (It’s a labrador, for crying out loud, not godzilla). And the rented house we stayed in for a week that had a notice in the hall requesting that dogs stay downstairs. But how we were to keep Molly downstairs when there was no door and no stair gate would have been beyond me, even if I had bothered trying. 3. Come on in. Quite a few places are, of course, more than happy to welcome our canine buddies. Around here in Somerset, most pubs are extremely dog-friendly and all of the local seaside towns have at least one beach that is open for dogs all year round. Some shops are equally enthusiastic. Pets at Home, of course. Most garden centres. And Molly and I were practically dragged into two separate Fat Face stores because the staff wanted to play with the dog. 4. Nuts about mutts. This is where things can go a bit too far. On occasion, some establishments such as country pubs and remote guest houses go a bit overboard in their professed dog-friendliness. Anywhere that provides dog bowls, beds or leads (who doesn’t take their own dog lead with them, for heaven’s sake?) is showing the early signs. This is often accompanied by things on their websites like ‘we love dogs’, ‘well-behaved humans welcome’ or even, in the worst cases, by text written by the owners’ own (and admittedly rather talented) dogs themselves. With these varying degrees of dog-friendliness, it can sometimes be a bit hit and miss when going to a new place for the first time. I’m not saying, of course, that canines should be allowed in everywhere. Molly is a dog, after all – not some kind of furry human. She’s quite happy to wait at home, in the car (only when it’s not too warm – no need to write in or call the RSPCA) or outside on the pavement. But, where possible, she does like to tag along. And don’t tell her I said this, but I kind of like to have her tag along, too. Even to Starbucks. 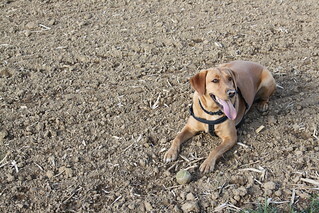 This entry was posted in Dogs and tagged Dogs, Holidays, Labrador, Molly, Pets, Travel by Simon Perks. Bookmark the permalink.